The U.S. constitution has granted you the right and honor to own a firearm. Treat this privilege with care and respect. As the owner of a firearm you have the responsibility and obligation of ensuring that any and all shooting activities are safe for everyone. This requires your personal commitment to carefully read, fully understand, and exercise the principles of proper firearm safety at all times. IMPORTANT WARNING: IT IS IMPORTANT FOR YOU TO RECEIVE PROPER TRAINING FROM A COMPETENT FIREARMS INSTRUCTOR OR AUTHORITY BEFORE BEGINNING TO SHOOT OR WHEN HANDLING THE FIREARM. NEVER • Give the shotgun to any person who has not thoroughly familiarized himself or herself with all of the information, safety rules, and warnings in the owner’s manual. 3) ALWAYS KEEP THE FIREARM UNLOADED UNTIL READY TO USE. Firearms should be kept unloaded when not in use. Whenever your pick up a firearm, immediately engage the safety device and remove the magazine to visually inspect the chamber and confirm that it is clear. Always unload all ammunition from the chamber and remove the magazine after: 1) shooting, 2) before putting the firearm away, 3) putting it into a holster, 4) when not in use, and when handing it over to another person. CHILDREN ARE ATTRACTED TO AND CAN OPERATE FIREARMS THAT CAN CAUSE SEVERE INJURIES OR DEATH. PREVENT CHILD ACCESS BY ALWAYS KEEPING GUNS LOCKED AWAY AND UNLOADED WHEN NOT IN USE. IF YOU KEEP A LOADED FIREARM WHERE A CHILD OBTAINS AND IMPROPERLY USE IT, YOU MAY BE FINED OR SENT TO PRISON. 1) COMPLETELY READ AND UNDERSTAND YOUR OWNER’S MANUAL GUIDELINES BEFORE USING YOUR FIREARM. You should fully understand the function of all of the components and mechanics of the firearm. Before you remove the firearm out of the box thoroughly read the owner’s manual on how to properly carry, handle, load, unload, and store your new firearm. Know the rules of proper gun safety and exercise them at all times because failure to do so may result in death or injury to yourself or others. Because it is impossible to list every firearm situation or scenario, be aware that certain circumstances may require additional safety rules unique to a particular situation. In these cases, we recommend that you use sound gun safety rules, judgment, and discretion. 2) ALWAYS LEARN THE SPECIFIC MECHANICAL AND HANDLING CHARACTERISTICS OF YOUR SHOTGUN. All firearms are different thus it is important for you to understand how to properly carry, use, and handle each one according to its specific guidelines. Before using any firearm, one must completely familiarize themselves with the type of firearm and its specific safe handling procedures for loading, unloading, carrying, shooting, maintenance, and storing. FIREARM SAFETY NEVER • Touch the trigger until you are ready to fire. • Engage in horseplay while handling a firearm. • Rely on the safety devices of the gun. Mechanical safeties are never foolproof and can wear out and malfunction over time. Remember to always handle all firearms using proper gun safety guidelines. 5) ALWAYS KEEP THE GUN POINTED IN A SAFE DIRECTION. A safe direction is one in which an accidental discharge cannot or would not cause injury or harm to yourself or others. Use extreme caution especially when loading and unloading your firearm. When handling any firearm always treat it as if it was loaded and ready to fire, even if you think it is empty. The recommended carrying position of your shotgun is with the hammer in de-cocked position. NEVER • Point your firearm at anything you don’t intend to shoot. • Use a firearm under the influence of alcohol, drugs, or any other substances that may impair your judgment, skills, or physical abilities. • Target shoot or hunt with a firearm when you are fatigued or too tired to operate the firearm safely. • Use your firearm if you have an illness or disability that could compromise your judgment and the safety of yourself or others. 6) ALWAYS USE THE CORRECT AMMUNITION. All firearms are manufactured to use a certain caliber or gauge of ammunition. Only use ammunition that the manufacturer has recommended. Always verify before loading that you have the correct ammunition that matches the manufacturer’s recom-mendations. 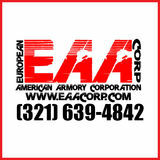 Using improperly reloaded or incorrect ammunition can cause death and injury. This can also damage or destroy your firearm which will void any warranty. FIREARM SAFETY 8) ALWAYS COMPLY WITH ALL LOCAL, STATE, AND FEDERAL LAWS THAT GOVERN THE OWNERSHIP, STORAGE, CARRYING, AND USE OF FIREARMS. NEVER • Vandalize any public or private property by using it as a target. • Poach a game animal out of season. • Kill any animal you don’t intend to eat. 9) ALWAYS KNOW YOUR TARGET AND WHAT IS BEYOND. Before you pull the trigger be sure of your target and what is behind it. Shoot only in areas that have approved backdrops such as a shooting range, or backstops such as a hillside or berm. Also, know how far your shot will travel in case you miss the target or the bullet ricochets. NEVER • Fire in the direction in which there are people. • Fire at a sound, movement, or a flash of color. • Shoot directly upwards or at a high angle of elevation. Firing at or into the air can have enough energy to travel long distances and accidentally injure or kill someone. • Shoot across a highway or other roadway. 10) ALWAYS WEAR EYE/ EAR/BODY PROTECTION. Gases and debris can cause injury so it is very important that one wears protective gear to preserve their hearing and eyesight. Also, while in the field wear at least 1000 square inches or more of blaze orange so that you can be visible by others. NEVER Discharge a firearm in a poorly ventilated area. FIREARM SAFETY NEVER • Risk an accidental discharge by walking with a loaded firearm when going through or climbing obstacles such as a fence or other obstructive barriers. • Rely on your gun’s safety mechanisms. • Sleep with a loaded firearm in your possession. 13) ALWAYS KEEP YOUR SHOTGUN IN THE SAME MECHANICAL AND STRUCTURAL CONFIGURATION AS IT WAS WHEN IT WAS MANUFACTURED. This shotgun was produced under specific manufacturer guidelines and should not be altered or changed under ANY circumstances. Performing conversions by altering the trigger, mechanical components, safety mechanisms, or using any other products other those provided in the original box is NOT RECOMMENDED by the manufacturer, and could result in death, bodily harm, or compromising your safety or the safety of others. Any alteration made to the firearm also voids the factory warranty. Like any mechanical device it is subject to normal wear and tear from use. In order to maintain optimal safety and performance it should be periodically serviced. You must regularly clean and lubricate your firearm to maintain its functionality, accuracy, safety, and reliability. Always before cleaning or lubricating any firearm make sure that you perform a safety check to make sure that the firearm is completely unloaded prior to performing any routine maintenance. If for some reason your firearm does require repairing, you must contact the U. S. importer for an approved service provider. Using unauthorized personnel to repair your firearm will void your manufacturer’s warranty. NEVER • Alter, convert, or change your firearm from its original manufacturer’s configuration. TRANSPORTATION For your own safety and the safety of others, always transport the shotgun unloaded, de-cocked and under lock. Never carry or transport the shotgun with a round in the chamber and the hammer cocked. 1) Point the shotgun in a safe direction. Remember, a safe direction means that the gun is pointed so that even if it were to go off, it would not cause injury, damage, or death. STORAGE Firearms should always be stored securely and unloaded, under lock and key. When storing your shotgun, keep it separated from any ammunition, and out of the reach of children and other inexperienced or unauthorized persons. Never place or store any firearm in such a manner that it may be dislodged or dropped. Depress the bolt catch lever and the bolt will be release forward. Unload and store the empty magazine. Pick up and store all ammunition rounds in a secured area. MKA 1919 SHOTGUN DISASSEMBLY INSTRUCTIONS MANUFACTURERS WARNING: THIS MANUFACTURED FIREARM WAS DESIGNED TO PERFORM WITH ITS ORIGINAL PARTS. IT IS YOUR RESPONSIBILITY TO MAKE SURE THAT ANY PARTS YOU BUY ARE AUTHENIC AND CORRECTLY INSTALLED AND THAT THE PARTS HAVE NOT BEEN ALTERED OR CHANGED. IT IS IMPERATIVE THAT ONLY FACTORY PARTS BE USED AS REPLACEMENTS TO ASSURE THAT THE FIREARM REMAINS FUNCTIONALLY SAFE AND OPERATES ACCURATELY. THE GUN OWNER ACCEPTS FULL RESPONSIBILITY FOR THE CORRECT REASSEMBLY AND FUNCTIONING OF THE FIREARM AFTER ANY DISASSEMBLY OR REPLACEMENT OF PARTS. IMPORTANT WARNING: BEFORE YOU BEGIN ANY DISASSEMBLY ALWAYS 1)POINT THE SHOTGUN IN A SAFE DIRECTION 2)BE SURE THAT YOU REMOVE THE MAGAZINE FROM THE FIREARM 3)VISUALLY AND MANUALLY INSPECT THE CHAMBER TO CONFIRM THAT IT IS EMPTY. 4. Unscrew the front handguard secure cap and remove it. 5. Pull the front handguard secure plate out and release it on the barrel. Slide the upper and lower handguards forward and set them aside. 10. You are now ready to remove the bolt, bolt carrier and recoil spring. Remove this set to the rear slightly. 11. Further disassembly is not required for regular cleaning and maintenance. 12. To separate the upper and lower receiver you will need a 6mm Allen head bit on a socket with a 10 inch extension, a ratchet wrench and a small rubber mallet. 13. Insert Allen socket into upper receiver retention bolt and loosen the bolt 4 full turns. Remove the ratchet and lightly tap the extension and socket to push the retention bolt forward. After the upper receiver starts to separate, loosen the bolt 2 to 3 more turns. Gently tap the extension to further separate the upper receiver from the buttstock. You will note an expanding gap as you do this. When the widening of the gap is around 1/4 inch, you can remove the upper receiver retention bolt and washer. Then tightly hold the upper receiver with one hand and use other hand to help separate the upper receiver from the buttstock/lower receiver. As the upper receiver separates, lift the receiver up and off. AMMUNITION All steel or lead shot 12 gauge shotgun cartridges manufactured and loaded with current U.S. industry specifications can be used in the MKA 1919 shotgun. This shotgun has 3 inch chambers and may be used with all standard commercially manufactured 2 3/4 inch (70mm) and 3 inch (76mm) shot shells. It is intended to be used with only standard ammunition of the proper gauge and loading. Remember that the shotgun functions by energy generated by gas expansion. Therefore, one must always use ammunition that is strong enough to fully cycle the action. 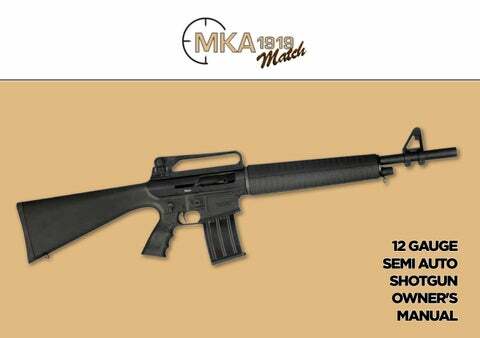 The MKA 1919 shotgun may require a breaking in period before it will function using light loads. If you experience any initial functioning problems, we recommended firing 3-4 boxes of standard hunting cartridges. AMMUNITION DISCLAIMER THE MANUFACTURER DISCLAIMS ANY RESPONSIBILITY FOR DAMAGE OR INJURY THAT OCCURS IN CONNECTION WITH OR AS A RESULT OF USING FAULTY, NONSTANDARD, REMANUFACTURED, HANDLOADED (RELOADED) AMMUNITION OR OTHER SHOTSHELLS OTHER THAN THOSE FOR WHICH THE FIREARM WAS ORIGINALLY CHAMBERED AMMUNITION WARNING: FIREARMS CAN BE DAMAGED, AND DEATH OR SERIOUS INJURY MAY RESULT FROM ANY CONDITION WHICH GENERATES EXCESSIVE PRESSURE OR UNCONTROLLED RELEASE OF GAS WITHIN THE FIREARM. THESE ADVERSE CONDITIONS CAN BE CAUSED BY CHAMBER OR BORE OBSTRUCTIONS, PROPELLANT POWDER OVERLOADS, OR BY OLD, DEFECTIVE, INCORRECT, OR IMPROPERLY LOADED AND ASSEMBLED SHOTSHELL COMPONENTS. IT IS EXTREMELY DANGEROUS TO USE A SHOTSHELL THAT’S PRESSURE EXCEEDS THOSE DEVELOPED TO INDUSTRY STANDARDS. ANY FIREARM CAN BE BLOWN UP WITH EXCESSIVE PRESSURE. LEAD EXPOSURE WARNING: POSSIBLE LEAD EXPOSURE CAN OCCUR WHEN DISCHARGING FIREARMS IN A POORLY VENTILATED AREA, CLEANING THE FIREARM, OR HANDLING AMMUNITION. LEAD AND ITS COMPONENTS IS A SUBSTANCE KNOWN TO CAUSE BIRTH DEFECTS, REPRODUCTIVE DESTRUCTION/IMPAIRMENT, CANCER, OR OTHER SERIOUS HEALTH CONDITIONS AND INJURY. ALWAYS HAVE ADEQUATE VENTILATION AT ALL TIMES AND WASH YOUR HANDS AND OTHER CONTACT AREAS THOROUGHLY AFTER EACH EXPOSURE. CHOKE SET THE MKA 1919 SHOTGUN COMES WITH 3 SCREW-IN INTERNAL CHOKES (FULL, MODIFIED AND CYLINDER BORE). EACH CHOKE CAN BE IDENIFIED BY THE NUMBER OF NOTCHES ON IT (FULL-1 NOTCH, MODIFIED-3 NOTCHES, AND CYLINDER BORE-5 NOTCHES). A CHOKE WRENCH IS SUPPLIED IN THE BOX WITH THE CHOKES. BEFORE YOU ATTEMPT TO INSTALL A CHOKE ALWAYS PERFORM A SAFETY CHECK TO MAKE SURE THAT THE SHOTGUN IS UNLOADED AND POINTED IN A SAFE DIRECTION. TO INSTALL THE CHOKE YOU CAN INSERT IT INTO THE END OF THE BARREL AND HAND SCREW IT. IT CAN THEN BE TIGHTENED WITH THE CHOKE WRENCH TO SECURE IT IN PLACE. CLEANING AND MAINTENANCE IMPORTANT WARNING: BEFORE YOU START CLEANING YOUR SHOTGUN ALWAYS MAKE SURE IT IS UNLOADED AND POINTED IN A SAFE DIRECTION. LUBRICATION WARNING: FIRING A SHOTGUN WITH OIL, GREASE, OR OTHER DEBRIS PARTIALLY OBSTRUCTING THE BORE MAY RESULT IN DAMAGE TO THE FIREARM OR INJURY TO THE SHOOTER AND THOSE NEARBY. BEFORE FIRING MAKE SURE THE BORE AND CHAMBER OF THE BARREL IS UNOBSTRUCTED AND DRY. NEVER SPRAY OR APPLY LUBRICANT ON SHOTSHELLS. FIRING ANOTHER SHOTSHELL BEHIND AN OBSTRUCTION MAY DAMAGE THE SHOTGUN AND CAUSE DEATH OR INJURY. ONLY USE LUBRICANTS PROPERLY AND SPARINGLY. YOU ARE RESPONSIBLE FOR THE PROPER CARE AND MAINTENANCE OF YOUR SHOTGUN. STEP 1) DISASSEMBLE YOUR SHOTGUN (SEE PAGES 19-21) STEP 2) USING A PROPER CLEANING ROD, RUN A SOLVENT-WETTED PATCH THROUGH THE BORE SEVERAL TIMES. THIS WILL THEN BE FOLLOWED BY RUNNING DRY PATCHES THROUGH THE BORE TO REMOVE ANY DEBRIS OR RESIDUE. STEP 3) IF THE BORE IS LEADED TO THE EXTENT THAT THE ABOVE PATCH CLEANING PROCEDURE DID NOT REMOVE THE LEAD, THEN SCRUB THE BORE FULL LENGTH WITH A SOLVENT-WETTED BRASS BRISTLE BRUSH. WHEN THE LEADING IS LOOSE THEN REPEAT STEP #2. STEP 4) THE SURFACES OF BOLT CARRIER, EJECTOR, AND INSIDE SURFACES OF THE RECEIVER SHOULD BE COATED VERY LIGHTLY WITH NON-PENETRATING LUBRICATING OIL. STEP 5) REASSEMBLE THE SHOTGUN AND WIPE THE EXTERIOR METAL SUREFACES SPARINGLY WITH AN OILED CLOTH. SWAB THE BORE WITH AN OILY PATCH BEFORE STORING THE FIREARM. STEP 6) PLACE THE SHOTGUN IN A SAFE, LOCKED STORAGE SPACE WHERE UNAUTHORIZED PERSONS CANNOT ACCESS THE FIREARM. NEVER STORE THE SHOTGUN IN A LEATHER CASE AS LEATHER ATTRACTS MOISTURE EVEN THOUGH IT MAY APPEAR DRY.